From New York Times & USA Today Bestselling Author of the Assassins, Bellevue Bullies, and Taking Risks Series comes a new, magical, radiant & powerful love story of the supernatural. As his only daughter, that makes me the princess of it all. Cool, right? Where to start? First, I want to thank the author for taking a break from writing contemporary romances (Go Assassins!) 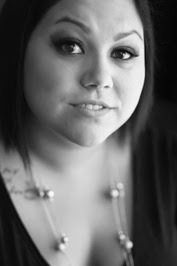 to try her hand at writing paranormal romance, because I really, really enjoyed Pieces. Second, I want to thank her for including the oft forgotten shapeshifter – the kind that can shift into any being, including other people as long as they make contact with the person whose form they’re assuming. While I can think of a few movies and shows that include this type of shapeshifter, I can only think of one book with such a character and that guy was actually the hobgoblin, not a true shapeshifter. So that alone made Pieces a unique read for me. But Aleo didn't stop there, because she made sure that Rebekah was such a fascinating character all on her own, that the only thing that made me put my Kindle down was the dire need to be a responsible adult. As the blurb states, Rebekah is a descendant of Dr. Frankenstein. I’ll admit upfront, I am not well-versed on the Frankenstein legend, so except for knowing that the creature we call Frankenstein is actually Frankenstein’s monster, while it is the doctor who is Frankenstein, I cannot comment as to how much of Rebekah’s family’s history coincides with the legend and how much of it is Aleo’s creation. Truth be told, from an entertainment perspective, I don’t really care because it’s fascinating either way. However, it does mean that I can’t properly give the author her due for the parts that are her creation, because while I suspect that the twists I enjoyed the most are hers, I just don’t know. That said, the Works itself is the world that Aleo has created and I fell in love with it. 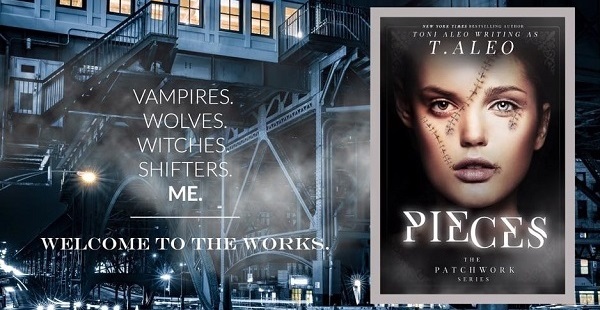 Set in New York City, each of the five species – the Patchwork, shifters, werewolves, vampires, and witches – seems to inhabit a separate borough. But the different factions are separated by more than just geographical boundaries as the rules that govern them dictate that the races aren’t allowed to mix in matters of procreation. But we learn that it has less to do with purification of the races, and far more to do with the potential of the hybrid offspring. As the leader of the Works, Rebekah’s father goes to great lengths to insure the rules are followed and that his people, the Patchwork, remain the most powerful among the supernatural beings. Yet despite all his efforts, his daughter remains mortal (<= not really a spoiler because it’s revealed in the first couple of pages, which you can download in a sample). The crux of this installment is Rebekah trying to convince her father that she is a responsible adult who needs some freedom, all while engaging in behaviors that contradict her claim because she’s being suffocated in the name of protection. Her situation is made worse by the discovery of a conspiracy to kidnap her as leverage to force her father to make the leader of the wolves immortal. Just as her defenses should be on high alert, the new employee at the bar manages to make it past her defenses with no effort – she trusts him completely when everyone around her is telling her to trust no one. And when we finally find out why, it made for an awesome twist. One thing I feel I should “warn” readers about is that while Rebekah might not be fully human (by our standards), she's like most 20 year olds, and that translates into a good dose of new adult angst – not something I encounter very often in paranormal romances. For me, this just helped to emphasize that despite her father's efforts, Rebekah really is a human girl, and that helped me to connect with her character. Despite the dangers she faces, the trappings of who she is in their society, the restrictions on what she can and cannot do, and her personal insecurities, she is ultimately just a girl in love with a boy. Is she rebellious? Absolutely. Does she put herself in harm's way? Oh, yes she does. But three years of being told what to do, not being allowed to leave the family's property, and not being told WHY, would grate on most anyone's nerves and lead them to be a bit reckless, too. Fortunately for Rebekah, she seems to possess good instincts, and actually listens to them. Because of the new adult feel to the book, parts of the storyline are kind of predictable. I don’t mean the predictable where you know exactly how the story is going to play out, but rather the type of predictable where you figure something out before Rebekah does simply because you’re not the 20 year-old whose world has been tipped on its axis. It doesn’t occur often, but it did cause me to want to throttle Rebekah and tell her to grow up, even though that wasn’t fair considering her situation. And it didn’t decrease my enjoyment any. 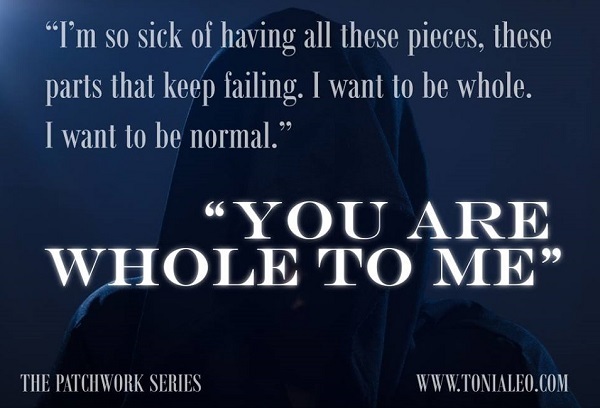 Unfortunately for this reader, Pieces’ ending came far too quickly, and while the ending is not the kind of cliffhanger that left me screaming in frustration, it did leaving me dying for book two. Thankfully, Aleo is a pretty productive writer, so I'm really hoping that the monsters of the Works are already pounding on her muse's door. 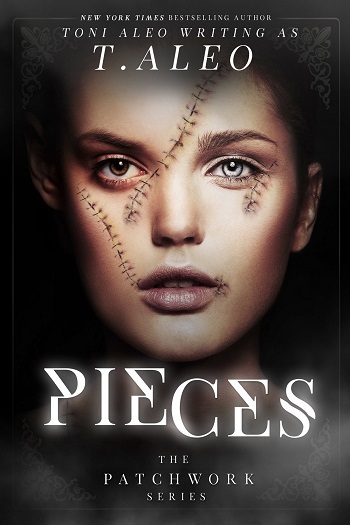 Reviewers on the Wicked Reads Review Team were provided a free copy of Pieces (Patchworks #1) by Toni Aleo to read and review.